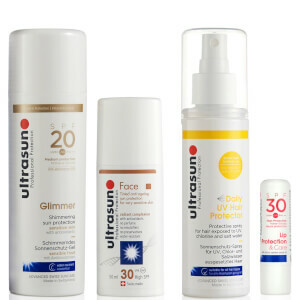 Stay protected on-the-go with the Festival Essentials Pack from Ultrasun. The must-have kit combines a shimmering body lotion, a tinted face lotion, a protective hair spray and a replenishing lip balm. A gentle, yet effective sun lotion that protects skin from harmful rays, whilst delivering an enviable glimmer that catches the sun. The water-resistant lotion is suitable for all skin and is ideal for protecting sensitive skin. Developed with broad spectrum SPF 20, the effective sun cream shields the body from UVA and UVB damage, whilst enveloping skin in a shimmering veil that complements sun-kissed skin. A lightweight, fast-absorbing formula that enhances radiance and delivers natural-looking colour, whilst providing broad spectrum protection to defend against damaging UV rays. Easy to apply, the tinted, water-resistant formula helps to minimise the appearance of wrinkles, as it infuses skin with optimal moisture levels. Ideal for very sensitive skin. A non-greasy formula for hair exposed to UV, chlorine and salt water. Delivering double protection thanks to antioxidants and a hair-specific UV filter, the weightless spray effectively detangles sun-stressed hair, whilst delivering long-lasting moisture and healthy shine. Suitable for all hair types. A regenerating treatment for dry and chapped lips. Infused with plant oils, the deeply nourishing formula softens and conditions lips, whilst providing broad spectrum protection to defend against sun, wind and cold temperatures. Lips feel smooth and comfortable around the clock. Glimmer Sun Protection: Apply to clean, dry skin, 15-30 minutes before sun exposure. Face Sun Protection: Apply to clean, dry skin at least 15 mins before going out in the sun. Hair Spray: Spray on dry or wet hair before/during sun exposure. Lip Care: Apply directly to lips. 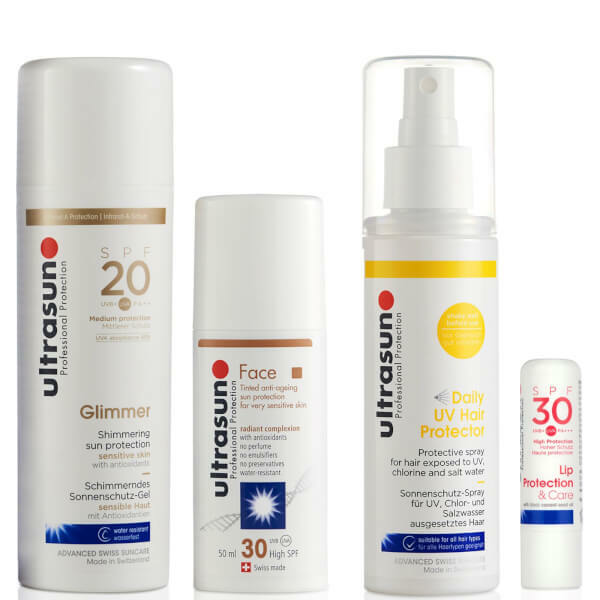 Glimmer Sun Protection: Aqua, Alcohol, Propylene Glycol, Lecithin, Ethylhexyl Methoxycinnamate, Butyl Methoxydibenzoylmethane, Mica, Sodium Acrylates Copolymer, Methylene Bis-Benzotriazolyl Tetramethylbutylphenol (Nano), Lactoperoxidase, Superoxide Dismutase, Tocopheryl Acetate, Decyl Glucoside, Disodium Edta, Glycerin, Paraffi num Liquidum, Pentylene Glycol, PPG-1 Trideceth-6, Titanium Dioxide, Xanthan Gum. Face Sun Protection: Aqua, Alcohol, Propylene Glycol, Glycerin, Lecithin, Kaolin, Ethylhexyl Methoxycinnamate, Butyl Methoxydibenzoylmethane, Coco-Caprylate, Methylene Bis-Benzotriazolyl Tetramethylbutylphenol (Nano), Titanium Dioxide (Nano), Sodium Acrylates Copolymer, Boron Nitride, Pentylene Glycol, Silica, Ectoin, Paraffinum Liquidum, Decyl Glucoside, Aluminium Hydroxide, Stearic Acid, PPG-1 Trideceth-6, Sorbitan Oleate, Disodium EDTA, Tocopheryl Acetate, Xanthen Gum, Superoxide Dismutase, Lactoperoxidase, CI 77492, CI 77491, CI 77499, CI 77019, CI 77891. Hair Spray: Aqua, Alcohol, Coconut Alkanes, Polysilicone-15, Dilinoleic Acid/Propanediol Copolymer, Polyquaternium-6, Coco-Caprylate/Caprate, Vitis Vinifera (Grape) Seed Extract, Ethylhexylglycerin, Sodium Chloride, Sorbitan Oleate, Glycerin, Argania Spinosa Kernel Oil, Parfum, Tocopheryl Acetate, Hexyl Cinnamal, Limonene, Benzyl Salicylate, Lecithin, Linalool, Caprylic/Capric Triglyceride, Ascorbyl Tetraisopalmitate, Tocopherol, Diisopropyl Adipate, Ubiquinone. Lip Care: C12-15 Alkyl Benzoate, Ethylhexl Stearate, Paraffinum Liquidum, Ehtylhexyl Methoxycinnamate, Diethylamino Hydroxybenzoyl Hexyl Benzoate, Ozokerite, Paraffin, Bis-Ehtylhexyloxyphenol Methoxyphenyl Triazine, Peg-8 Beeswax, Cera Alba, Cocoglycerides, Cyclopentasiloxane, Candelilla Cera, Ceresin, Dipropylene Glycol Dibenzoate, Limnanthes Alba Seed Oil, Cyclohexasiloxane, Ribes Nigrum Seed Oil, PPG-15 Stearyl Ether Benzoate, Lecithin, Copernicia Cerifera Cera, Tocopheryl Acetate, Butyrospermum Parkii Extrakt, Aroma, Tocopherol, Ascorbyl Palmitate, Glyceryl Stearate, Clyceryl Oleate, Citric Acid.